What physical storage does Internet Recovery use if my internal drive is broken? It seems, most likely, I have an issue with the SSD or the physical connectors to the SSD. If that is the case, where is this OS X Base System being stored? Is it stored on my SSD somehow or is it using RAM or is there some hidden storage somewhere that I don't know about? The installer creates a RAM drive (a disk container in the systems memory) that can mount like a normal file system. If all you can see is base system than it is likely that your internal SSD is toast and needs to be replaced. I am not familiar with exactly what Apple loads on the recovery partition but I would imagine just enough to boot the system and a couple of utilities (disk Utility.app, etc.). If a recovery partition is unavailable everything is downloaded over your network connection. After you boot into Recovery Mode the entirety of macOS will be downloaded over your network connection. Once you have a bootable sytstem you will need to restore your files/apps from a backup. You could take the Mac into an Apple store or independent Apple repair shop and have them verify that your drive is indeed toast, which you may have to do anyway unless you are handy enough to replace the drive yourself. You could have a look at that procedure at ifixit.com I have no relation or interest in that company, just a happy user. Not the answer you're looking for? 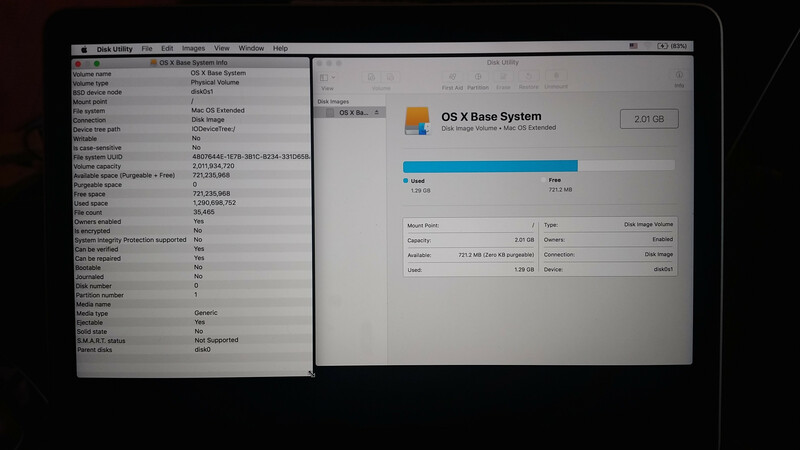 Browse other questions tagged macos disk-utility high-sierra partition internet-recovery .